A business case is a description of the reasons for the project and the justification for undertaking it. The business case is based on the estimated costs and the expected outcome. Teams can waste months developing their own business case template and building it in Confluence. 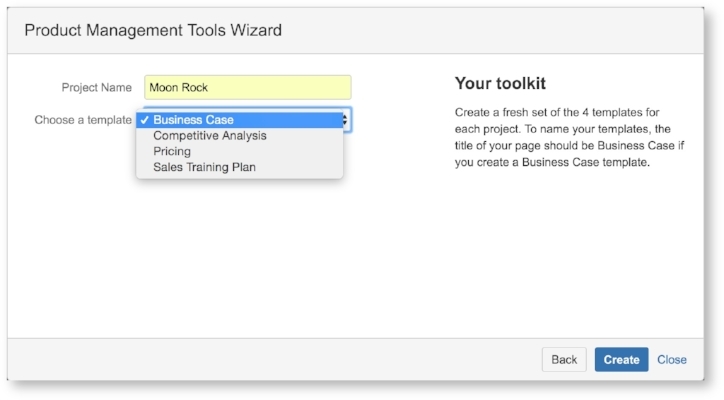 The Product Management Tools Business Case template uses Best Practices and is ready to go in Confluence as soon as you create a new page. The Business Case blueprint summarizes information detailed in the Product Management Tools collection of blueprints. To add a fresh Business Case blueprint to your Space, enter your Project Name and choose 'Business Case' from the drop down menu. Begin by naming your blueprint "Business Case." You do not want to name this page after your project name because each page within Confluence must have a unique name. Your Space within Confluence should be named after your project, and each blueprint page within that Space is named according to the function (ex: "Business Case"). Special instructions on how to complete the Business Case are shown only while in "Edit" mode and are highlighted. These instructions will not appear on the main page or in an exported PDF or Word version of your Business Case. The section uses a "Panel" macro with white text. In order to see the text - and edit it - simply highlight inside of the Panel macro box. You will find it easiest to change the text to a darker color while editing and then change to white for the final version. Understanding your target customers, or Personas, is critical to building a strong Value Proposition. Three examples of Buyers, or Personas, are included in the table for instructional purposes. Add as many Buyers as relevant for your project. Click on 'Create New Issue' and select your project from the dropdown menu. Add in any desired additional details and comments and click on 'Insert.' 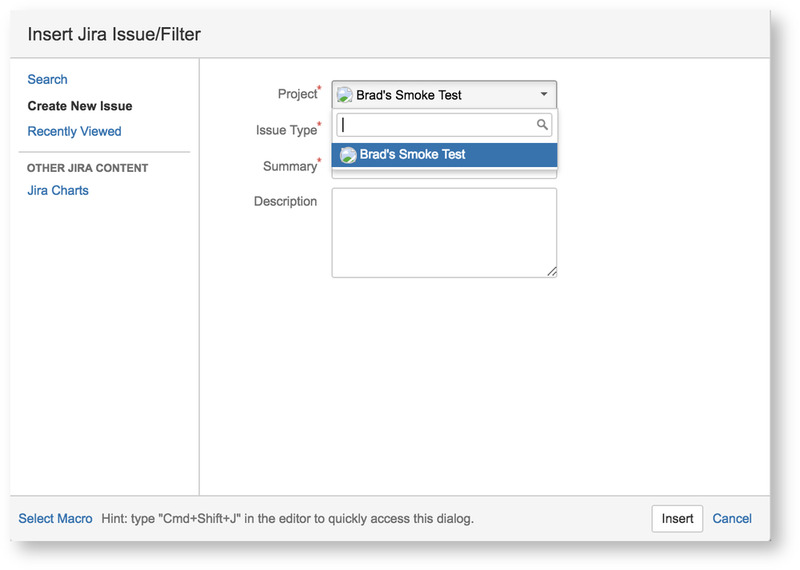 If you do not see your project in the drop down selection menu, contact your Administrator to request connecting your Confluence space to the Jira space for your project. 'Insert' your Jira issue and now edits made to Buyer Needs are automatically updated for the Development teams in Jira. The first panel macro contains your project name and description. While in "Edit" mode, click on the panel until the "Edit, Remove" options appear. Choose "Edit" to change the project name and description. You can also customize the colors to match your corporate colors if you desire. Successful projects involve many cross-functional teams who work together to create something new. Unsuccessful projects do not consider the needs of colleagues who work upstream or downstream of the project and do not plan for their needs. List the names of the teams who will interact with, support, develop, sell or build the product proposed in your Business Case. Teams often involved are included in the table to get you started. Add or remove teams to represent your company structure. The considerations that are important to these teams are listed in the first column of the table. Examples are included to get you started so that you can replace them and add as many as you need to accurately reflect the needs of your colleagues. Change the cell which intersects the team and consideration to a light blue. The number of cells highlighted in light blue is the number of anticipated dependencies for your project. This will help your Project Manager and Team Leads begin to plan team structures and timelines. All good requests for funding and Business Plans acknowledge that there are alternatives to the proposed project. The alternatives will vary in strength from "acceptable" to "terrible idea." Analyze the value of three alternatives. "Do Nothing" is always an alternative and should be one of the three alternatives analyzed. This table contains a macro which colors the options from green on the left (your strongest option) to red on the far right (terrible option). Insert your options into the table according to their strength. For example, if one alternative is actually better than your proposed project then it is added to the far left of the table. Do not overanalyze all possible alternatives in this table. Present the three most likely or viable alternatives and leave any remaining alternatives to be discussion points. Assess the potential market opportunity size and analyze how the concept differs from competitive offerings (including your organization’s own products). "The market" is defined as the revenue available from all actual and potential buyers or users (customers) of your product. Source your market information from journals, reports, sales history, sales people and customer interviews. The Chart macro will convert the table into a bar chart. You can change the names, values and number of columns and/or rows directly in the table to reflect your market data. To change colors or other details, click on the panel and choose "Edit." This is how you can assign your corporate color to your data and a competitor's signature color to their data (as an example). The bar chart format is suitable for data on multiple markets from the same competitors, as shown in the example. To present data on a single market, choose the pie chart option in the 'Edit 'Chart' Macro'. The default settings will produce a bar chart with blue bars. 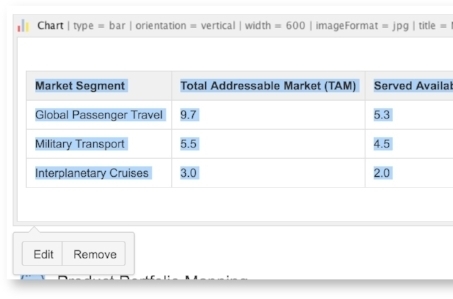 Identify customer needs by segment and indicate if that need is met by a current product in your portfolio, a current product in a competitor's portfolio, or by your proposed project. The goal of this section is to identify the specific unmet needs of each market segment that will be fulfilled with your new product. Use the 'Roadmap Macro' (already embedded in the blueprint) to create a simple Gantt chart of timelines. Click on the "Edit" option to personalize timelines, labels and categories. What risks should be considered prior to approval of this project? What is the likelihood of each risk and impact on your business? For each probability, fill in the corresponding risk color using the table buttons at the top of the page. If there is 0 probability then leave the table cell blank. Replace the examples in the template with risks specific to your project. Alternative #1 & Alternative #2 should match the alternatives analyzed in the 'Alternative Options' section above. Document all major assumptions regarding revenue models, costs, budgets and market penetration. Costs should be as accurate as possible but it will be difficult to achieve 100% accuracy this early in the product development process. Estimate where needed. Important! Document your assumptions in the yellow lines at the bottom of the table. Add more lines as needed. These assumptions will be helpful later in the product development process as you refine your forecasts. Red font indicates a cost and should be deducted from revenues. Detail the funds and man months (MM) requested to begin early development and concept prototypes. Compare projected costs and revenue to determine if the project is financially attractive, assuming a life span of 5 years. A man month is the amount of work that can be accomplished by a single person (gender neutral) under reasonable working conditions (40-45 hr/week) in a single month. Estimations of both cost and time (man months) are helpful to executive staff when comparing projected results from different projects under review. It's important to be as accurate as possible in your estimations as the resources allotted to your project (if funded) might be derived from this table. If you estimate low in order to get funded, you risk being under-resourced.